Both the 2012 Edition of the NFPA 99 Health Care Facilities Code and the 2014 Edition of the National Electrical Code are applying new definitions of patient care rooms that will increase the minimum number of receptacles required in each room. Rooms which are used to perform high risk procedures will require more outlets, as these procedures often require more portable electrical medical equipment. Previously, the minimum number of receptacles for Operating Rooms was not specified, but is now 36. The requirement for Operating Rooms is much higher than all other patient care areas because there is the greatest need for portable medical equipment. 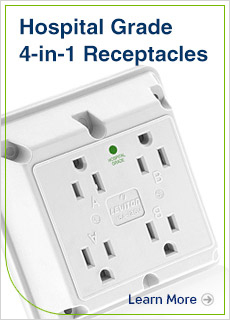 To assist health care facilities in complying with the new code requirements, Leviton offers Hospital Grade 4-in-1 receptacles. These devices allow you to increase the number of receptacles in your facility without having to pull new wires and can easily be mounted to a standard single gang wallbox without the need of an adapter plate. Hospital Grade 4-in-1 Receptacles provide a simple transition in retrofit applications to meet the additional power needs of health care facilities. Are you up to code?